Ashutosh Gowarikar’s 2004 film Swades features Shah Rukh Khan in the role of a NASA scientist who visits India and decides to stay back in his motherland and work for the upliftment of his countrymen. There is a sequence in this film where Shah Rukh takes the initiative of setting up a hydro electric power station in a village. It is a six and a half minute long sequence where we see the entire village congregated to witness the generation of electricity. Water has been stored in a reservoir at a height and a turbine fitted to a dynamo has been positioned at a lower level along the path of the ‘waterfall’. 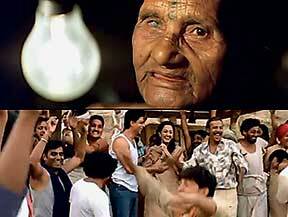 The sequence begins with an electric bulb dangling from the thatched roof of an old woman’s hut. Some villagers come and inform the woman that the bulb will soon light up. Soon the sluice gate is opened, water gushes out of the reservoir, expectant faces watch the water droplets bouncing off the turbine blades even as Mohan (the character played by Shah Rukh in the film) keeps an eye on the speedometer reading. The voltmeter crawls up to the magic figure of 250 volts. Suddenly the flow stops, the voltmeter needle drops to zero. Mohan runs up to check and finds some fibres blocking the mouth of the reservoir. The water begins to flow again and eventually there is a long lightning like spark across the electric poles. The bulb in the old woman’s house begins to glow. She whispers ‘bijli’. After showing the clip, initiate the discussion by asking questions about conservation and transformation of energy. The lamp lights up and radiates energy and happiness. But from where is this energy coming? Obviously one form of energy is getting transformed into another. To begin with, water at a height has potential energy. When the water is allowed to fall, the potential energy gets converted into kinetic energy. This energy gets transformed into rotational energy of the turbine as the water hits the turbine. As the turbine rotates, the electric coil between two poles of the magnet rotates and current begins to flow through the coil. The faster the rotation, the stronger is the current. This is a fairly simple calculation based on the formula E = m x g x h.
The next question can be a little more complex, “Estimate the electricity requirement of an entire village of 100 households.” To answer this question they will have to estimate how many fans and lights each household may have and how many kilowatt hours of energy these may consume in a day. It might help to compare the electricity bills of their own homes. The teacher may introduce the concept of one unit of electricity at this juncture. Also, there is a sociological dimension to this question and peer to peer exchange can work very well in answering this question. Once the students get a reasonably correct estimate, they will realize how much more energy an urban household consumes compared to a village household. The next logical question is “How much water should the reservoir store to generate this electricity?” The clue to this question is there in an earlier scene of the film where Mohan says that the reservoir will be built on this hillock and its dimensions will be 5 metres by 1 metre. However, this data is incomplete as Mohan does not mention the depth of the reservoir. The students can be asked to back calculate and estimate the depth of the reservoir. Students’ group work on these two questions and comparison of their results will easily take up 40 minutes of the class. The teacher may conclude the class by asking “Why was it so important to push up the electricity to 230 volts?” If the teacher does not ask this question, a bright student in the class is very likely to ask the question because in the sequence shown to them a lot of emphasis has been given to the voltmeter reading through repeated close-ups. The answer to this lies in the design of the standard bulbs. The students must realize that car headlights require only 12 volts to give an equal amount of light. One last question the students are likely to ask in this class is about the sparks flying between the electricity poles. This is a cinematic license taken by the filmmaker to create a spectacular effect. In reality, there will be no spark. Spark is caused by a discharge of electricity through air. Here the electricity will flow through the wire between the poles. Hence there will be no discharge. Many films take such cinematic liberties. The teacher must point it out to the students because an unsuspecting mind would take for real whatever is shown on screen. When a film clip is used as a teaching aid, it is likely to generate a lot of interest in class. The teacher can harness the high level of interest by giving an assignment like “Find out major centres of hydro electricity generation in India”. Such assignments will help to prolong the learning experience of the students and keep their interest alive. This lesson using the clipping of Swades has been designed for class X. But the clip will be equally engaging to higher classes as well as lower classes. With some modification in the exercises and the post screening discussions, the lesson can be taken with class VIII or class IX students. Using popular films in the classroom has several advantages. There is an immediate connect between the teacher and the students. Interest level of even the backbenchers goes up sharply. Dry subjects suddenly spring to life. Abstract principles get illustrated in real life situations. Therefore, it is a good idea to keep a compilation of appropriate clippings of popular films to be used in the classroom occasionally. It is easier to create a compilation for literature, history, and social sciences. But for physical sciences and life sciences too, popular films have some gems to offer. Popular films are easily available, a lot of human and financial resource goes into their making and this gives a touch of sophistication to the look of the film. An appropriately chosen scene of a popular film can touch upon various facets of life and integrate various academic disciplines on to one platform. The clip used in the class should be less than 10 minutes in duration. The clip should be appropriately selected. It should bring the ideas to be discussed under sharp focus. Some basic editing often becomes essential to cut off the distractive parts like song sequences, sub plots and other digressions. In certain cases the song sequence may be the relevant clipping. Even though cinema mimics life very closely, cinema is not life. It is a construct. Every shot in the film is a conscious decision of the filmmaker. Hence many things shown in the film may not be real. These ‘unreal’ things have to be pointed out to the students. A case in point is the spark that passes between the poles in the Swades sequence discussed in this article. As teachers, let us take a second look at popular films and identify portions that may be used to elevate the classroom experience of the student above the humdrum of talk and chalk. The author is the secretary of Bichitra Pathshala, an organization that promotes learning with moving images. She is also an associate director at iLEAD Institute, Kolkata. She can be reached at subha.dasmollick@gmail.com.